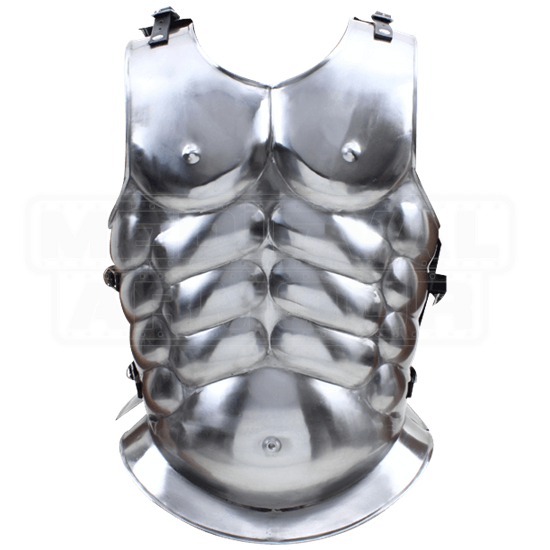 This Steel Muscle Cuirass is a replication based off armour first worn by the Greek hoplite. In common Greek and Roman art, this style of cuirass is worn by generals, emperors, and other high ranking and influential society members. This incredible armour piece dates back to late Archaic Greece and became popular throughout the 5th and 4th centuries B.C. It was made to fit the torso and display an idealized human physique. Range of movement is excellent in this style of armor, because there is no collar and the arm holes are fairly expansive. The breastplate attaches to the backplate along the sides and shoulders using leather straps. This armour is made from 18-gauge steel. Any warrior will look more statuesque in their appearance with the help of this Steel Muscle Cuirass.